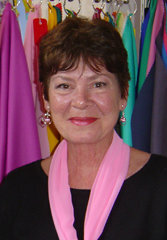 Kathryn Kalisz (1948-2010) was the founder and CEO of Sci\ART Global LLC (2000-2010). Both an artist and a colour expert, she revolutionized the method of Personal Colour Analysis (PCA). The Twelve-Tone Color System™ was the result of her creativity and scientific expertise. Kathryn dedicated her life to the science of colour and its effects on our lives. We (Terry and Christine) both found the Sci\ART independently, several years apart. Right away, we recognized that it made sense, and even explained many of the gaps that kept us from pursuing other systems. Once we read about the Sci\ART approach, we were ready to commit. We still use and teach this system today, with additions to the drape numbers in the same basic process. Prior to her work in Personal Colour Analysis (PCA), Kathryn was one of four Master Munsell Colorists for Munsell Color Co. in New York (now owned by X-Rite, Grand Rapids, MI). 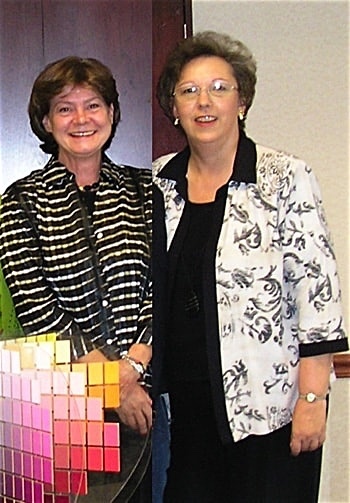 In 1991, after being with Munsell for seven years, she left the company to devote more time to artistic endeavours, and her study on the relationship between colour and human beings. As an artist, she understood colour harmony and its value for our health and well-being. She was also aware of the challenges of the 4-Season approach to PCA. Her unique skills, 100% accuracy in colour vision and her focus on the benefits of harmonious surroundings, provided the foundation for her research. She developed the 12 accurate and consistent palettes upon which our system is based today. Kathryn noted that the majority of people have a colouring that falls in between two True Seasons. Thus, the 12-Tones System includes 8 colour groups, referred to as ‘Neutral Seasons’ that are between warm and cool. Her triumph in achieving this cannot be overstated. Now, all people, everywhere could be accurately colour-analyzed into one of the 12 colour groupings. With the palettes as a starting point, Kathryn went on to create a system to find the right palette for each person. It needed to be structured, consistent and rigorous, and flow seamlessly from palettes to test drapes and the many other instruments that analysts and clients use. Drawing from high-level colour industries, she carried out analyses in standardized neutral gray surroundings. This was revolutionary. Every colour imaginable has a setting on three independent scales, which define its warmth or coolness (hue), degree of lightness or darkness (value), and the softness or brightness of its pigments (chroma or saturation). Playing with these three settings, Nature creates harmonious compositions that are beautiful and mysterious. Like a scene from a movie, imagine opening a 3-combination lock with an encryption in which two of the numbers continually shift depending on the other number. She understood how each colour was defined by its own chemical behaviours, and how biology and psychology are intimately linked in colour perception. Through this level of expertise, indeed virtuosity, she was able to create compositions that feel harmonious to human eyes. Because Kathryn knew the behaviour of colours at every possible combination of hue, value and chroma, she could recognize the relationship of every colour with the surrounding colours of the palette. She brought balance and synergy to the palettes – this was Kathryn’s achievement. She created the most reliable PCA experience available, and the most harmonious result for your appearance. The 12 Season palettes which you are offered today are beautiful. They feel supportive in the way that Nature designed and which humans instinctively recognize. In person, Kathryn was calm, friendly, methodical, and articulate. A dedicated teacher, she cared deeply about the student. Her answers to questions were patient and thorough, with genuine concern that she had offered enough examples and explanation. Kathryn also taught paint mixing classes, and practiced coloured light therapy. Although fashion and cosmetics are a natural part of PCA, these were not her priority. Beyond improved appearance, Kathryn desired to help everyone understand the value of light and colour, for their physical and emotional benefits. Terry Wildfong of Your Natural Design, recalls Kathryn treating a student with blue light after an injury, and a conversation about the value of orange light for depression. Kathryn believed that our natural colours emanate from our personal skin tone, a result of our individual electromagnetic energy. Photo of Terry Wildfong and Kathryn taken in Grand Rapids, MI, October 2006, at the time of Terry’s training to become the first certified Sci\ART trainer. When the PCA branch of her business became extremely busy, Kathryn began training trainers to allow her to concentrate on the wellness aspect of her business. She promoted the presence of trained analysts in all cities and countries so that everyone might have the opportunity to know their colours and the profound benefits that they offer. She strongly believed that our physical and mental health can be improved by wearing and surrounding ourselves with our colours. Through her book Understanding Your Colour (now out of print), Kathryn shows how colour is an essential component of improving how we look – and perhaps more importantly, how we feel. Kathryn’s life was lost under tragic circumstances in January 2010. The devastation caused to her family and the PCA community brought us to a standstill for a period of time. As ever, those who remain must pick up the pieces and go on. We have continued to evolve, but the vision and genius of Kathryn has remained intact. We are grateful to Kathryn for her person and her legacy, and we feel honoured to carry on her work.